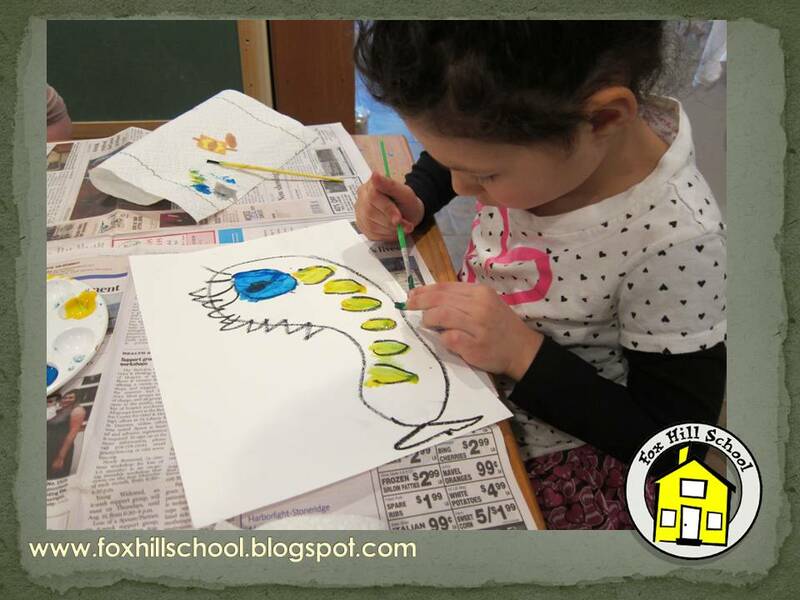 In honor our Dr. Seuss' birthday the weekend we did all things Seuss this week! 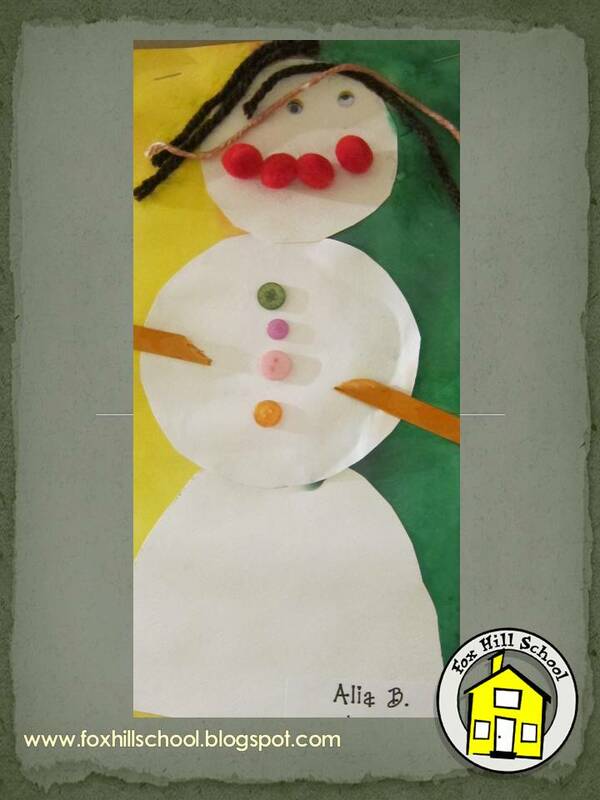 In Art class at the Kindergarten we made a super fun project that I found on Deep Space Sparkle, the blog of the woman who is teaching the art class I am currently taking. We read the book One Fish, Two Fish, Red Fish, Blue Fish by Dr. Seuss (of course) and set out to make they very Seussical fish! I generally like to offer the children in my programs process orientated art. We want them to get messy, use their imagination and see what happens! Since I now have a group that will be going into first grade next year I thought I should also be teaching them some art skills. This project was the best of both worlds! 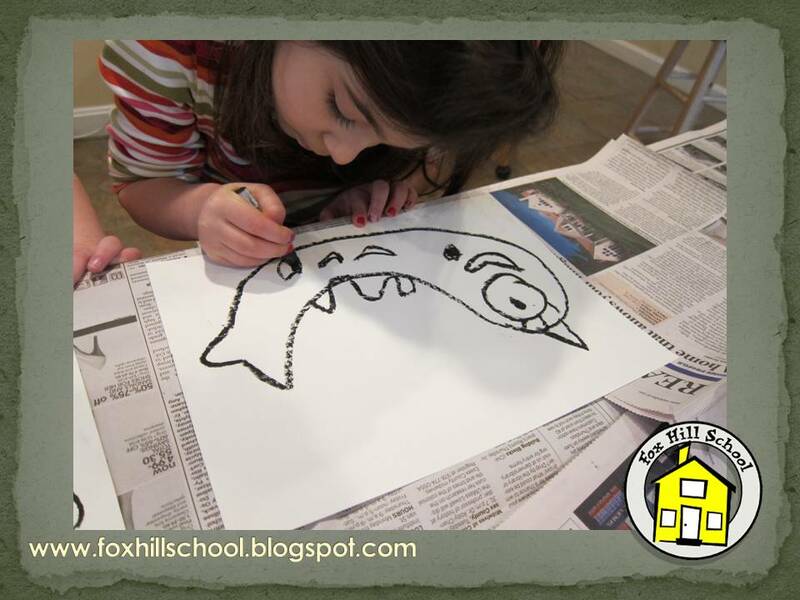 Today I taught the kids how to draw a fish - either a standing fish or a swimming fish - just like in the book. 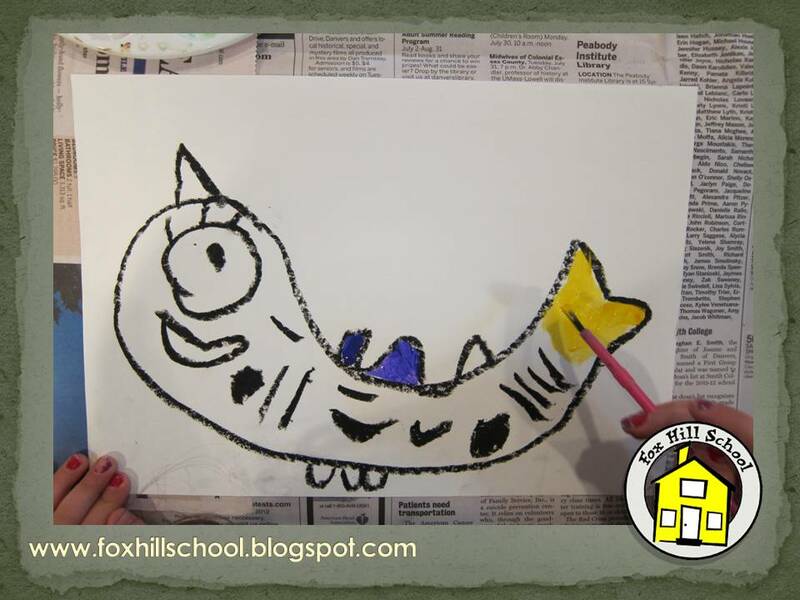 The kids used a black oil pastel to draw their fish. Even though I gave them step by step directions about how to draw a fish, no two fish came out the same. It was really amazing to see them design their masterpieces! Then I gave them tempera paints to color their fish. We decided that Dr. Seuss uses very bright colors so we shouldn't mix all our colors together! I let them know that tomorrow we would be cutting out the fish so that it wasn't important if they went out of the lines while they were painting. They were so into their amazing fish all of them were super careful while they were painting anyway! Check back tomorrow to see our finished Seussical fish! Here are some of the Dr. Seuss books we read this week. Click on the picture to purchase from Amazon! 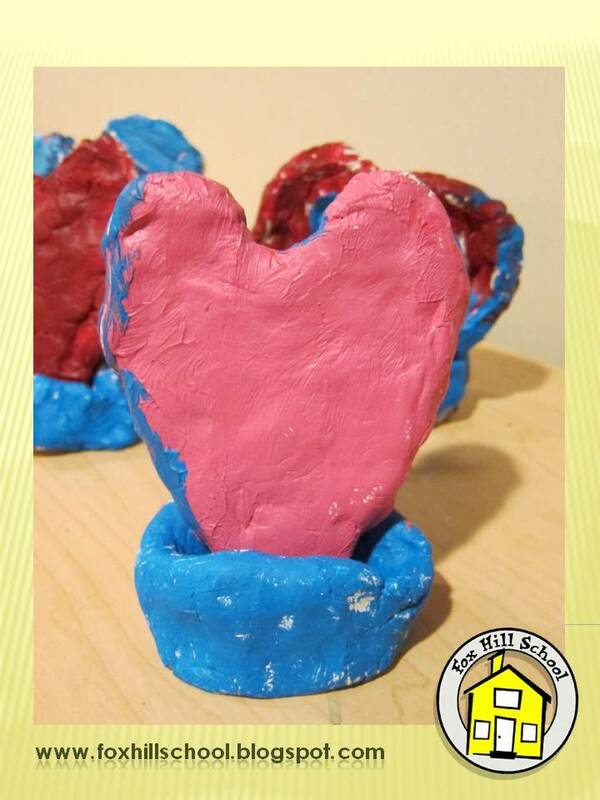 Here is one more fun and easy Valentine's Day art activity! We used thick, white, poster board paper and cut out heart shapes, leaving the middle cut out as well. We gave each child another piece of white paper and put the cut out heart shape on top. They took dobbers or chubby paint markers and covered the paper completely, making different colored dots all over the paper. When they were done, we picked up the cut out heart shape and the children were left with a tie-dyed painting with a big, white heart in the middle. Very pretty and fun! Here are some of the Valentine's Day books we have in our classroom. Click on the picture below to purchase the book from Amazon! 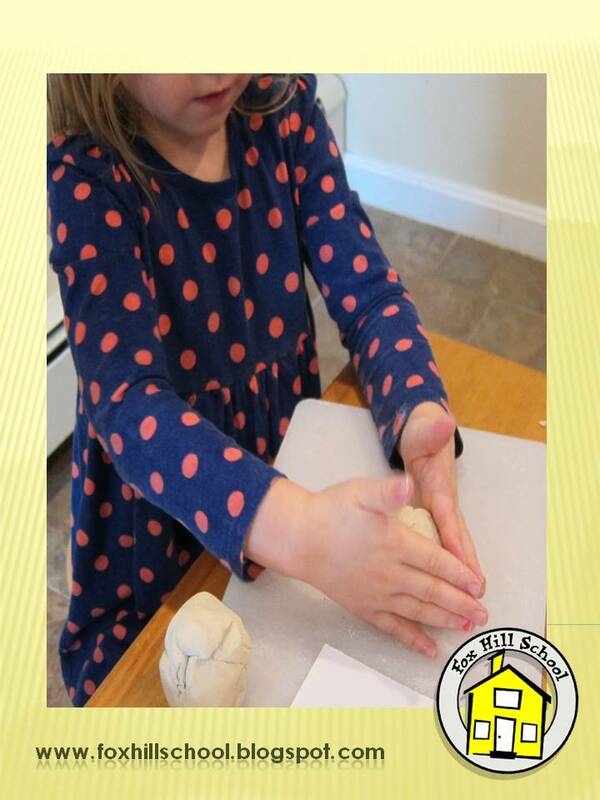 Even though Valentine's Day has passed, we didn't want to forget to blog about another great art activity for Valentine's Day. It's fun, a little messy, and super easy! 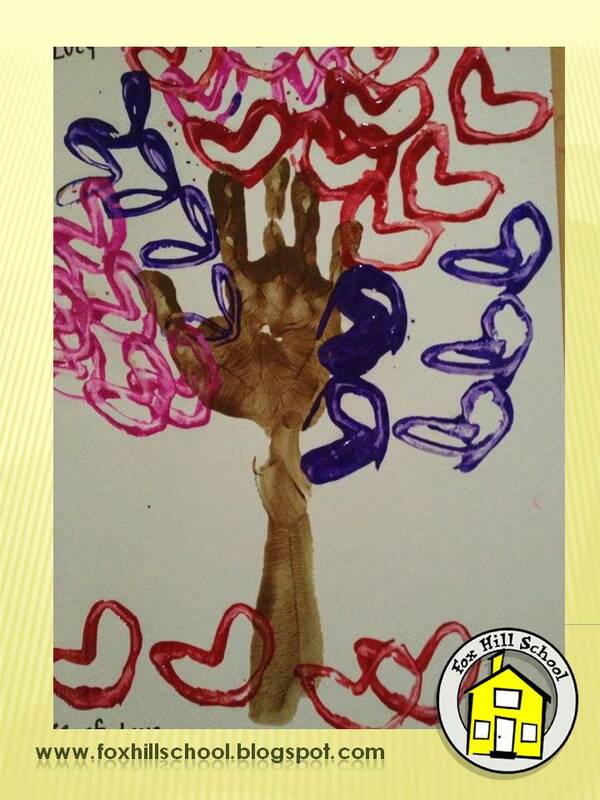 We made heart trees using a hand print, heart stamps, and paint. 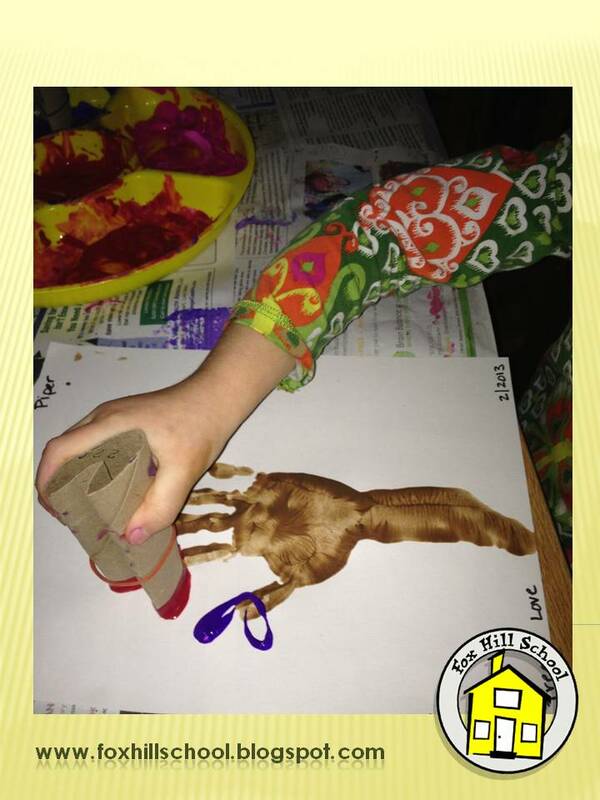 First, we took a child's hand and forearm and painted it brown. Then we stamped their hands, vertically, onto a piece of white paper. This will be the trunk and branches of the tree. 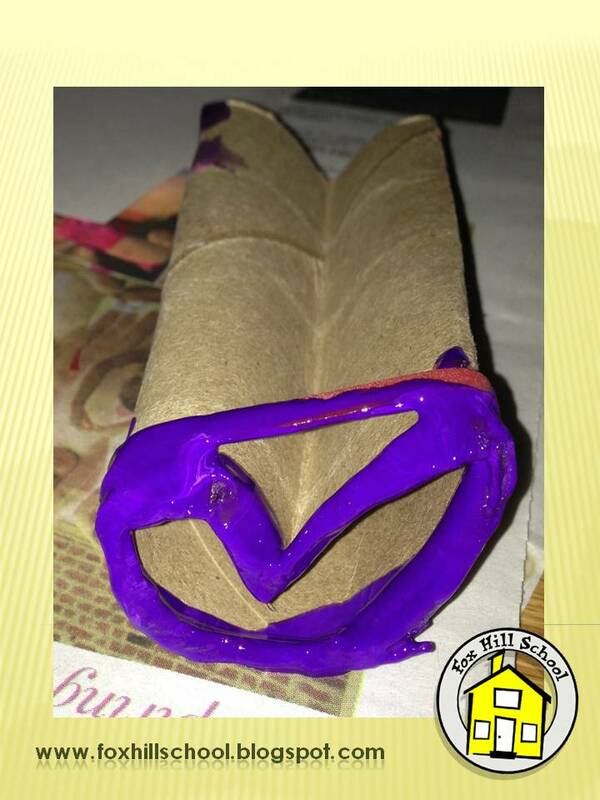 Next, we folded toilet paper rolls in half and put elastic bands around them. 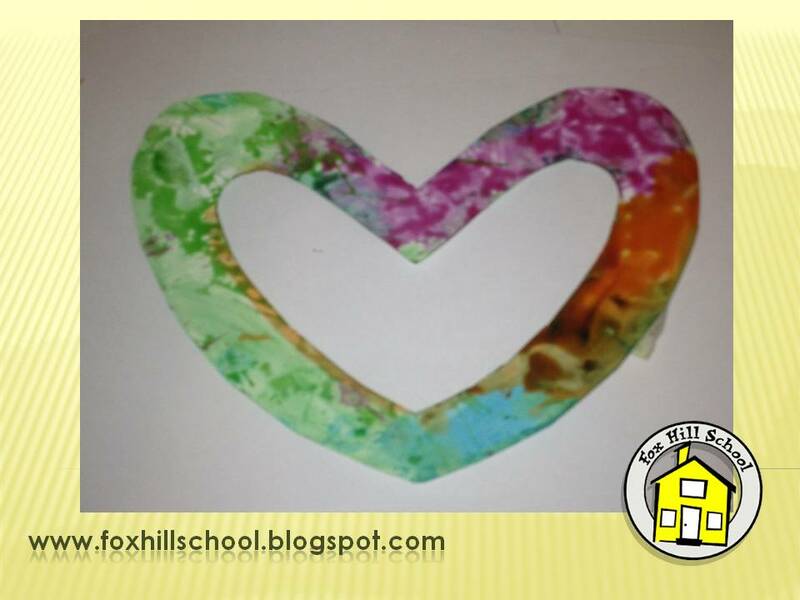 This makes heart shapes out of recycled materials. So fun and easy! And, what I liked best, every heart shape was different! After the kids were done washing their hands, we let them stamp heart shapes all over the tops of their tree. These will act as the leaves of the tree. We used red, pink, and purple paint. The toilet paper rolls make fun hearts that are uniquely shaped. The kids loved painting their hands then stamping the hearts! Here are some Valentine's Day books we have in our classroom. Click on the picture below to purchase them from Amazon. Welcome back from February vacation! We had a fun outing for the kids at our school to do over vacation. 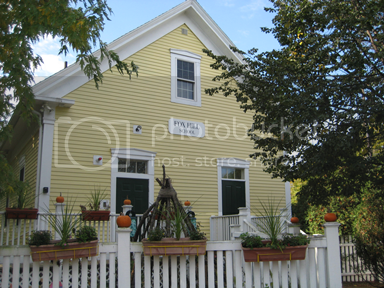 The Wenham Museum has a great program for schools. 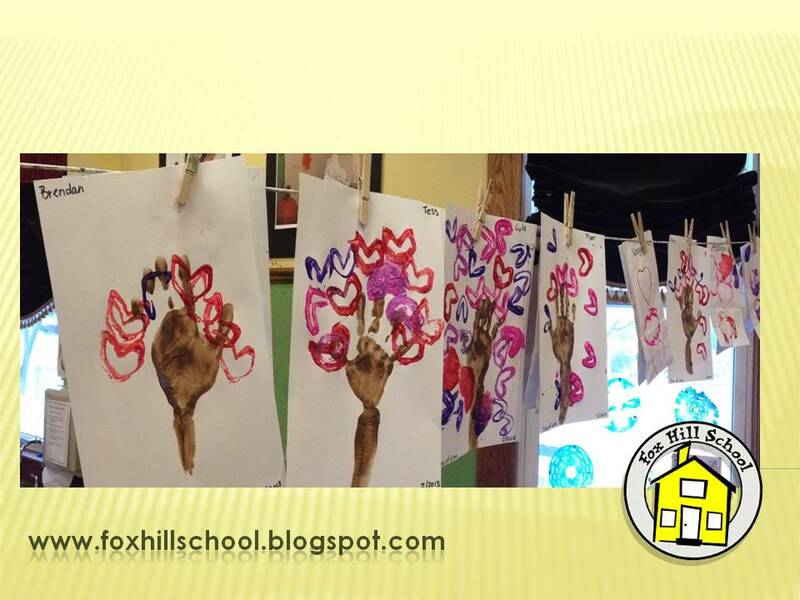 They have a Children's Art Gallery and each month schools can put their children's artwork on exhibit! 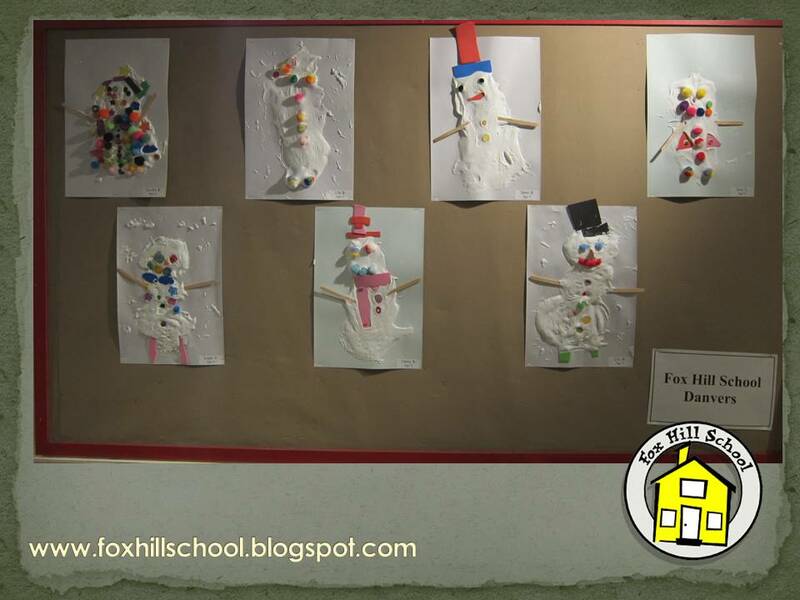 February was the month for the Fox Hill School! 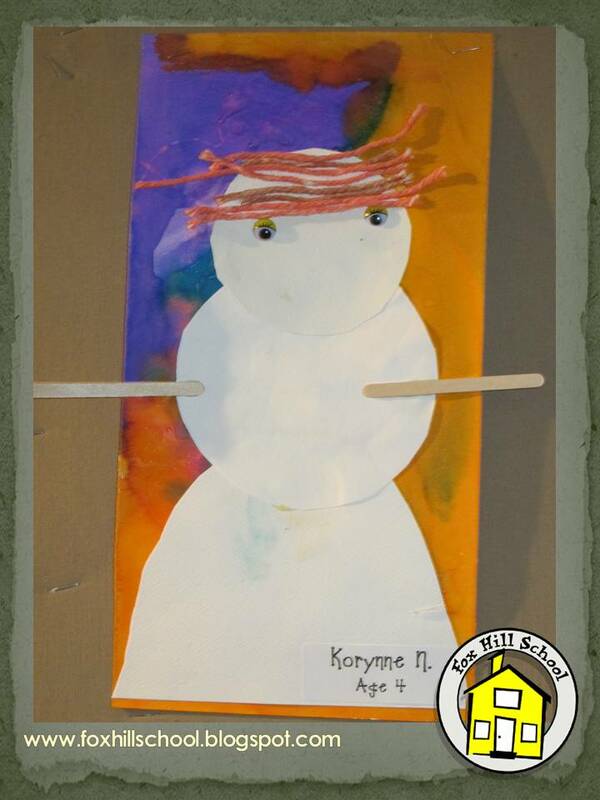 All children who will be going to Kindergarten or First Grade next year was able to have a piece of their artwork displayed in the museum. Each artist also received a pass for their family to visit the museum to view the gallery! 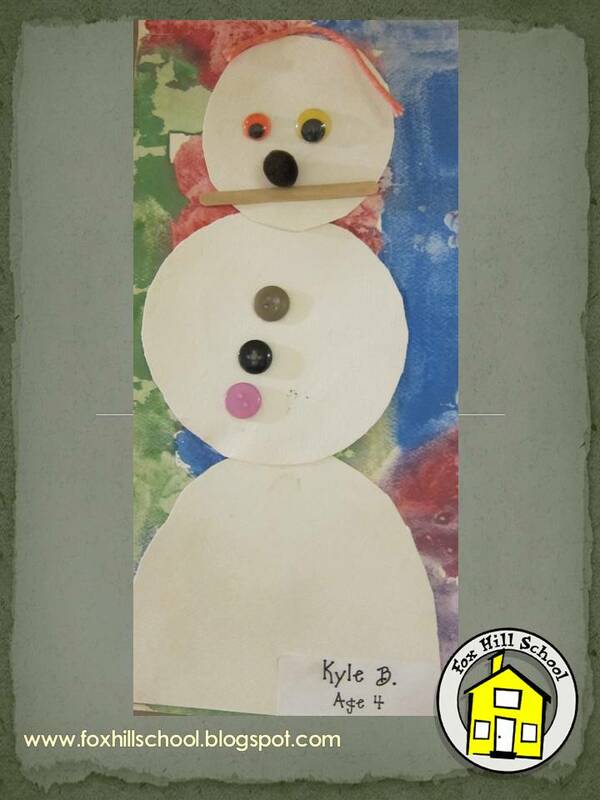 The children in our PreK/Kindergarten program made snowmen out of shaving cream and glue. 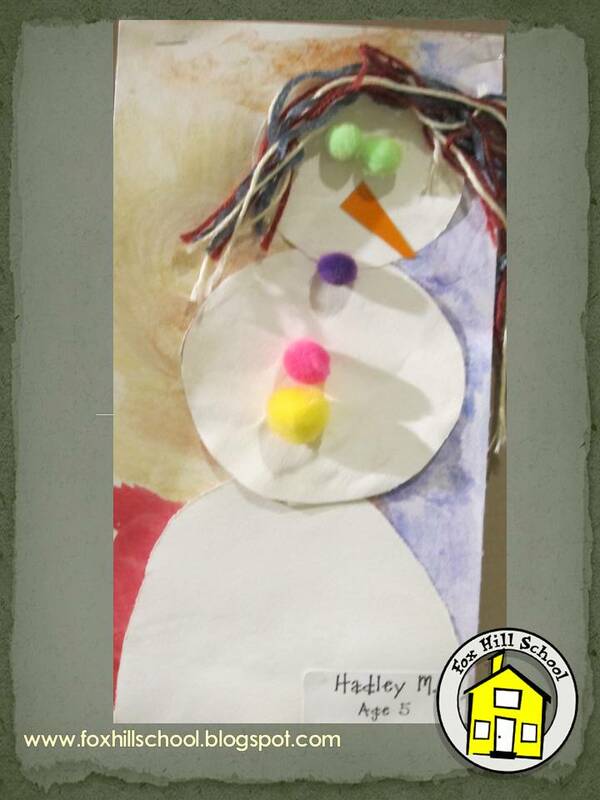 Our children in the preschool program made collage snowmen. I found the idea on a blog called Deep Space Sparkle. This is a great site for art project ideas. I am actually starting an online art class today, Teaching Art 101, through this website. I am quite excited about it! I have homework for this course so I may be trying some of my new techniques out on my Kindergarten class. Stay tuned to see the magic! 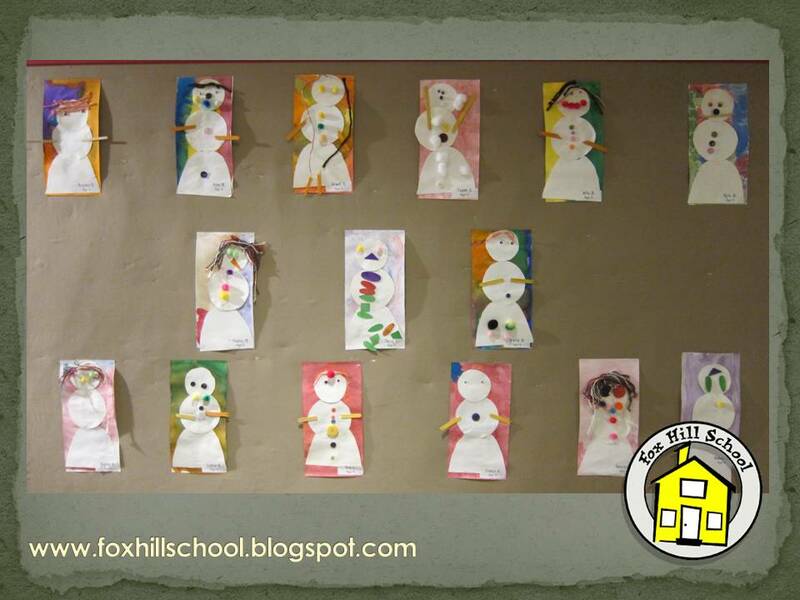 Here are some close-ups of some of the collage snowmen displayed at the Wenham Museum! They are awesome! After four snowy days at home, the kids were excited to be back at school and even more excited that Valentine's Day is this week! In art class this week we read The Day It Rained Hearts by Felicia Bond to go along with our art project for the week. My daughter went to the deCordova Sculpture Park and Museum a few years ago on a school field trip for art. One of the sculptures there is a giant heart (you can see it in the background of the link above). 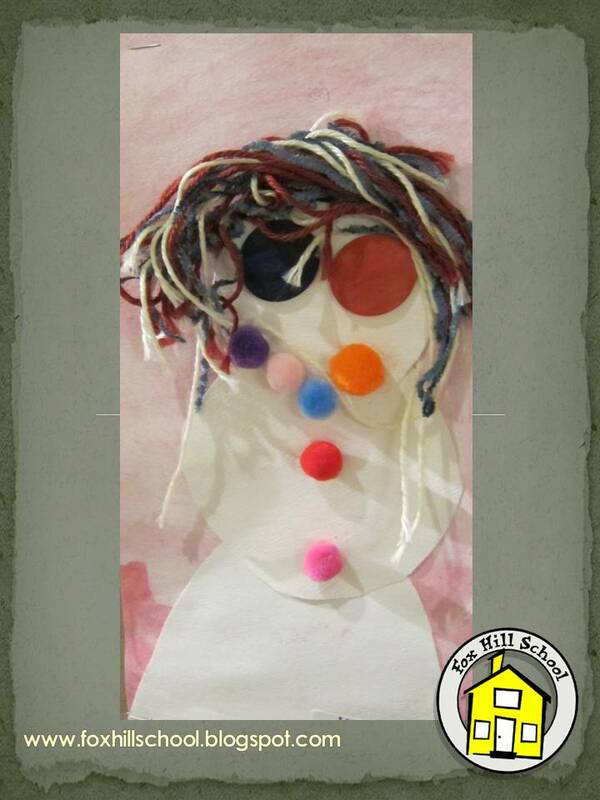 I loved the sculpture she made so much I wanted to try it with my Kindergartners! 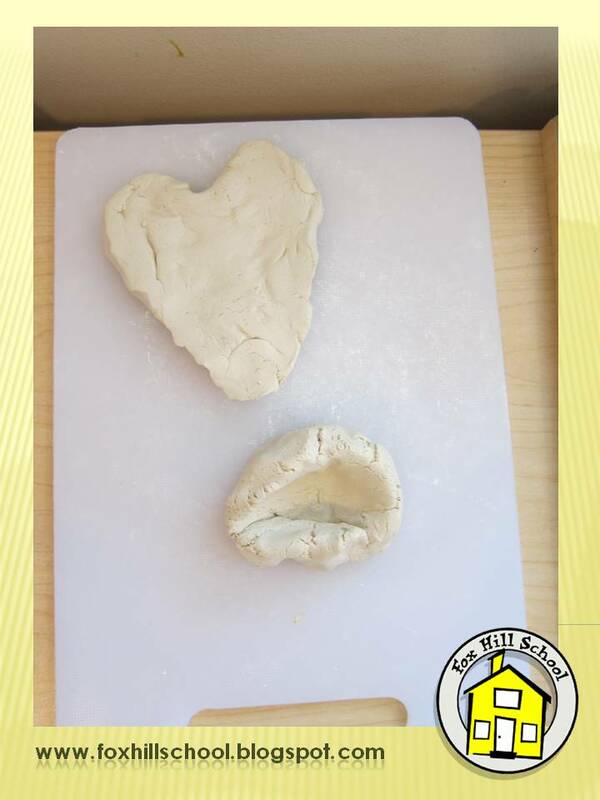 Last week we started making this fabulous Valentine's Day present for our parents - hearts made out of clay with a stand. The kids started with two balls of clay. They flattened the first one and tried to shape it into a heart. They thought this was pretty tricky at first but they stuck with it and the hearts came out great! The next piece of clay they made into a pinch pot. We made pinch pots earlier in the year so they were familiar with the process. Once they made the pinch pots, they had to mold it so that the heart they made would fit in it and also stand up.Then we let the projects dry until our class this week. 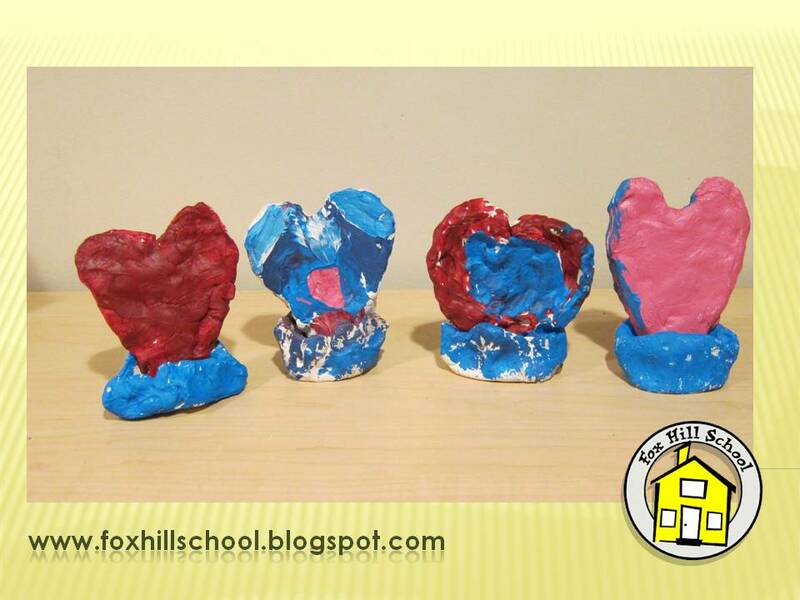 I put some wax paper on each child's cutting board with their clay hearts on top of it. We painted the hearts with acrylic paints (acrylic paints show up much better than tempera paints do on clay). 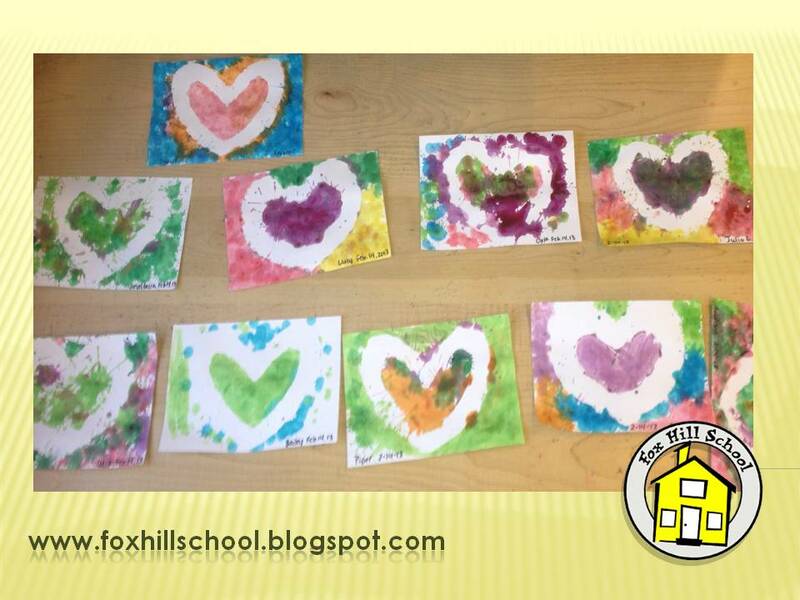 I asked each child what color they wanted to paint their hearts and put the paint directly on their wax paper. This made for very easy clean up and each child could have their own colors. They needed to paint both sides of the heart and the wax paper allowed them to paint both sides at once since the wet paint won't stick to the wax paper. The projects are amazing! They went home to the parents this week for Valentine's Day. The kids were so proud they made such wonderful presents for their families! We have February vacation next week so it was the perfect start to a nice vacation! Here are a few of the finished hearts. We are taking next week off from the blog for vacation but we'll be back with more exciting ideas on 2/25/13! If you would like to get The Day it Rained Hearts for your classroom, you can buy it from Amazon by clicking the book below. 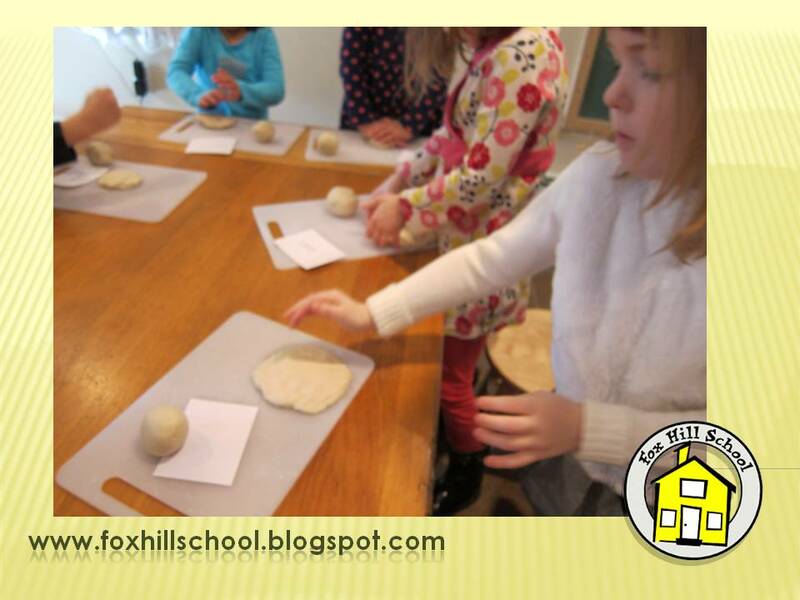 Today at the Fox Hill School we read a book called (surprise, surprise!) Valentine's Day by Anne Rockwell. 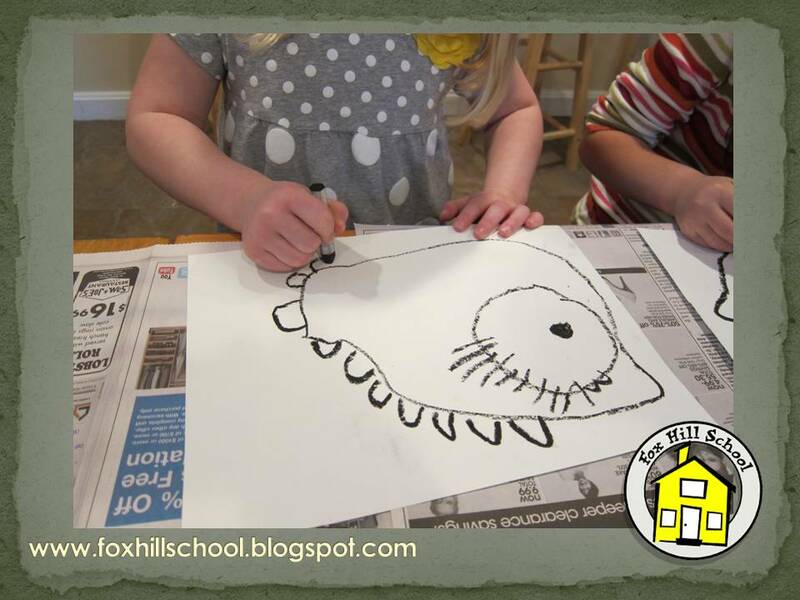 In this story, a preschool class decorates a class Valentine's box. Then each child makes a Valentine to put in the box. 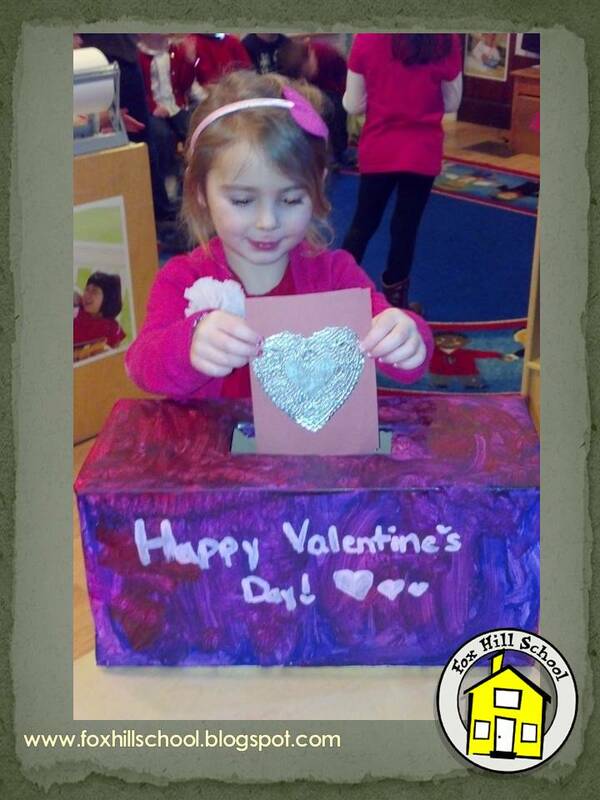 On Valentine's Day each child gets to take a Valentine from the box and see who made their special Valentine! We thought this would be fun to do, so we did it! Earlier in the week, each classroom made their own class Valentine's box. They painted it until it was perfect! They made their secret Valentine's using construction paper, stamps, doilies, stickers, (really anything they wanted! ), wrote their name on their Valentine and put it in the class Valentine's box. Today each child took out a Valentine to see who their secret Valentine was! When they saw a child choose their card, they would yell "I made that one!" We could feel the love as they excitedly took out their cards! 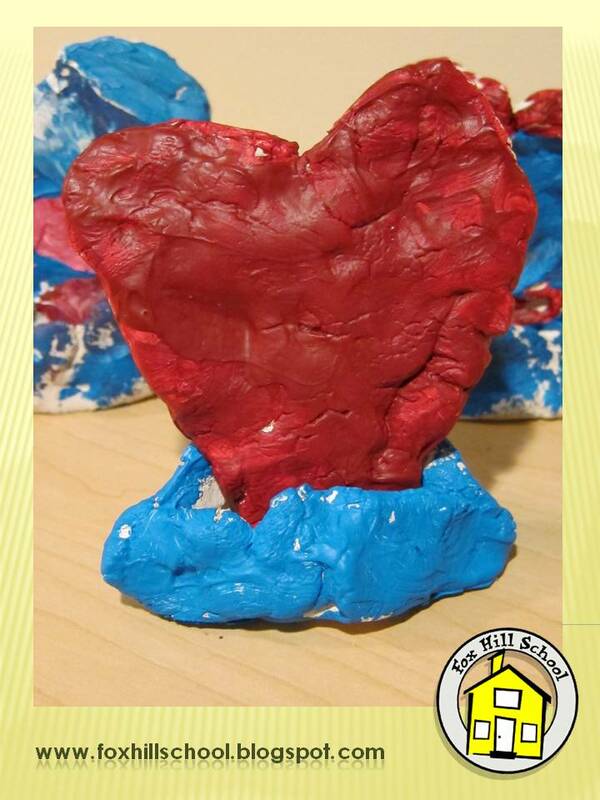 Check back tomorrow to see the fun Valentine's art project we did at the Kindergarten! (It's a surprise for the parents so no peeking until everyone brings theirs home!) Happy Valentine's Day! These are some of the Valentine's books we have in our classroom at the Fox Hill School. To purchase these books from Amazon, click on the picture. And two eyes made out of....Buttons?!? !